Who is Jack Arnow? Ask him and he'd probably tell you he's just a guy who loves working out. He'd also say he likes to chin-up. He does like to chin-up and happens to be good at it … very good. At 64 years of age he chins with weight that guys half his age can't do. Of course he's done one arm chins as well – coauthoring the well received one arm chinning guide on Dragondoor. He learned how to chin under the informal coaching of one Jasper Benincasa – arguably one of the strongest chinners ever to grab a bar. Jack and I have talked over email for the past year or so and I'm always amazed at his training knowledge and experience. He is truly a living legend. I was fortunate enough this past January to meet up with Jack at Primal Fitness for a training session. Later that day we sat down for an interview. Jim B:How did you get started lifting weights and doing chin-ups and different things like that? Jack A:Well actually, I almost never lifted weights in my life. It was probably the first year in high school and my friend Jerry Bevino said to me, “oh come on, let’s go to this chinning bar, there’s a chinning bar set up somewhere.” And I went with him because he’s my friend and there was a bunch of kids there and they started chinning and that’s how I started. And there was this guy there, Jasper, who’d come by, older guy, 22 years old than us, and he did one arm chins. And we didn’t even think about that! Jasper actually put up the chinning bar himself in this empty lot. It was concreted into the ground and very solid. It’s not there anymore, they tore it down awhile ago and put up a house there. But I started to hang out there after school. And that’s how I got started. And at the time, I was just, not particularly strong or anything. JB:Did you know that it was extraordinary for him to be doing those one arm chins? JA:Not really. I’ve never seen anybody do it. I wasn’t impressed or not impressed, that’s what he did. And I didn’t think about it, you know, it was just fun to go there and hang out with the guys and just chin. I didn’t really think about it. Eventually I knew it was great. JB:So what are some of the feats you saw him [Jasper] do? JA:I saw him do a one arm front lever. I saw him very often do, in the 40’s, alternating one arm chins. (20's for each arm, 40's total) That’s one righty and one lefty in a motion where you move along the bar. Apparently I learned as I got older no one else in the world does. His record is 50 which he’s very proud of. In the 40’s I saw many, many times. He did muscle-ups, I don’t remember exactly him standing on the bar, but he’d like fly up. He did front levers, not only one arm front levers, but two arm front levers for what seemed like minutes; changing the angle, kicking, doing other exercises, while he was horizontal to the ground. He did flags of all kinds. He chinned with weight in the following way – people who were poor like me didn’t go to gyms – people would hang on him. Maybe I’d hang on him. I later found out that he had people much heavier than us hanging on him that someone 265 lbs hung on his 130 lb body and he did it. He didn’t brag. It took years for me to find out he could do a one arm front lever. In fact he said for many years it was impossible to do a one arm front lever and then one day I walked up to the bar and said “that was a one arm front lever!”, and he said “ehh,” he mumbled, apparently he didn’t like the fact that it’s not perfectly analogous to a two arm front lever. Your body is, although parallel to the ground, you’re tilted toward one arm in someway. He was a purist. He was a purist in everything. He liked no momentum. When he told you to do stuff – “don’t cheat”. Like an iron cross. Don’t use a false grip. All this kind of stuff he would say. JB:What other advice would he say in terms of chinning? JA:He never gave advice – once in a while if he’d watch you. I remember, it might have been my first one arm chin, he says “turn in, just turn in”, and I sort of turned in and all of a sudden I went up. I guess I was hung at a certain spot. And he just said turn in and I did it. And since then, a few times, I’ve told people that when I watch them, “turn in”. You sort of corkscrew in and it makes it a little easier. JA:No. I didn’t know he could do the C.T.I.. He said that the C.T.I. in the picture was done in front of a crowd on a horizontal bar. Jasper says that a young Bobby Bowden was in attendance there as well. He's recently told me a list of his other strength accomplishments and stories. When he was 17 years old in high school he says he did 130 consecutive chin-ups, which was so boring that he never did two arm chin-ups again. Instead he started working on doing strength skills that no one else could do. 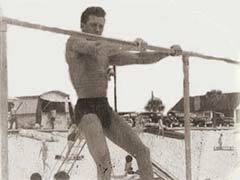 In 1948 he says he did a one arm chin with an extra 82 lbs [~37kg]. This 82 extra pounds was in the form of a small boy he held in one arm! That same year, he did 20 alternating one arm chins (one with left, then one with right) with 25 extra pounds. So that's 10 one arm chins each side with extra weight. In 1952, at a Madison Square Garden exhibition, actor Sir Rex Harrison was there and asked Jasper to "do something for us". Jasper asked if he could put his legs around Rex's wife and climb up a rope. Understandably she said no! He climbed the rope in a front lever instead, to crowd applause. Apparently he was quite confident in his rope climbing ability already as he said he had climbed the rope before with a 148 lbs (~67 kg) of extra weight! In 1961, at age 41, he did 50 alternating one arm chins, 25 each side. He said he'd chin along a 6 foot section of scaffolding. This way he could simply continue in one direction without having to stop and turn around as often. That same year he also did 19 consecutive one arm chins with his right arm and 18 consecutive ones with his left on a horizontal bar. JB:…But he was still doing a lot of stuff, did you see him do any rope climbing? JA:No. But over the years, being I went to the YMCA gyms, people would see me doing one arm chins and they’d come over and they’d say “I, I saw some guy!”, and it turns out they were talking about Jasper. And they’d tell me they saw him climb the rope with one hand. And at least ten people over the years told me this. I never saw him do it. He never told me about it. I just read about it. JB:So he was very modest with it. JA:…maybe pulled harder, yeah, but he said, you had to have someone hang from it so that it didn’t spring up, otherwise it’d spring away from you. JA:I saw him when he was 85, at that time he was still doing one arm chins, righty and lefty, he was proud because the lefty was only coming back recently. He gets injuries like everybody else, he works out, I think, almost everyday. The front lever and even the bodyweight chin, but his weight was down to about 128 or 126 and most of his life he was heavier than that. And I think I got the impression it was touch and go. But he loves working out, he’s a very happy man. JB:Now and then… I mean all the way through. JA: If I go back in my life. 22 alternate one arm chins. (11 each arm) Although I never practiced for maximum, I just sort of worked out. I did seven righty one arm chins once, six lefty once. I did a one arm chin once with a 35 lb dumbbell in my opposite hand. This was done from a free hang. I didn’t practice for any of these things, I just practice alternates. And I chin with weight, I think it was my bodyweight plus 30-35 lbs, and I don’t remember what I weighed at the time. I never practiced that at all. It was rare, but this guy at the gym did a bodyweight chin with me hanging from him, and I wanted to impress him, so “now you hang from me”. He was heavier than me and I asked him his weight and I forget what he said or what I was, but I remember the time that it was very heavy. I did very good front levers. I did very good muscle-ups, but you can’t describe that because you can do muscle-ups and muscle-ups … it’s called straight arm muscle-ups, but it’s not really quite straight. You sort of fly up and come down, fly up and come down, I did them in the twenties, lots of them. JB:Did you ever try them weighted? JA:You can first do it like this **motions chin-up pulling motion** it’s a very high chin, and you sort of lean in. It’s a little swing, but it’s mainly straight with the chinning pulling hard. 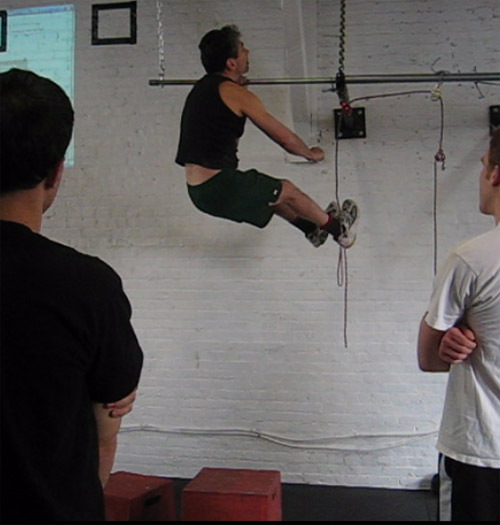 So that was called reverse muscle-ups. 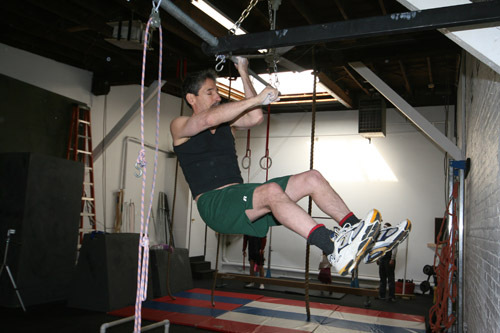 In my 50's I did a reverse muscle-up again as well. You have to pull really hard. 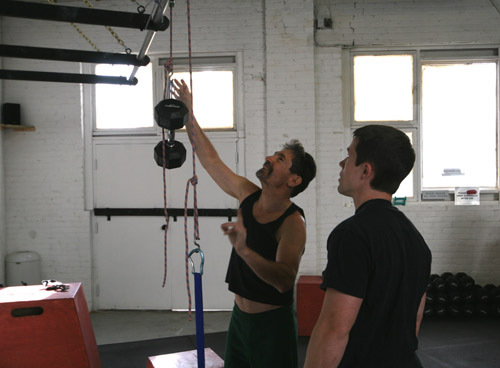 JB:That seems like it could be easier than a normal muscle-up because your grip it would be a stronger pull? JA:Well, it was actually harder. Maybe because I didn’t practice it much, or … I felt it was harder. That was considered a harder thing when I was a kid – the reverse muscle-ups. Mostly we’d just practice the other muscle-up. We’d have the palms facing away. That seemed harder, but once you got good at it, you could really fly. And I guess all these things build your strength in different ways, but I never thought about it much. We just did it. 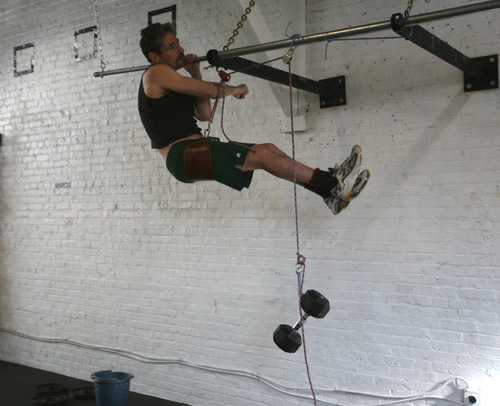 That was fun, the reverse muscle-up, the straight arms, you feel powerful – you’re flying up. I wouldn’t even try such things now, it’s stress on your joints. But if you ask my greatest accomplishments, it’s been doing the one arm chin again when I was 50, because I probably last did it when I was 35. When I had kids, when they were younger, my life got busy other ways, I’d always play basketball or exercise, but not in the same way. I remember when I was 35 for some reason I could still do one arm chins, and at 50 I couldn’t. And I started exercising those again, I got it back, and since then, I’ve had it and lost it, had it and lost it a few times, because I’ve gotten injured. I keep thinking I’ve finally learned how to not to get injured, but my weakness is overtraining and you can always blame the last twist you did, but in essence I now realize I just overtrained most of my life. I wanted to push on and wasn’t happy with just one one arm chin, I wanted to get to eight or ten. Now I just take it easy. For me, relatively easy. And it’s a very short, light workout, generally. But I’m still making advances, and I hope to have the one arm chin back shortly, and when I do, I consider that my greatest achievement in my life, exercising-wise. Wait until you get there and you’ll see what problems you have when you’re older! You may be strong, but the body is different. And you have to adjust to your body. JB:This is a real general question, but advice on a one arm chin? The main points that you always see that people have mistakes with or have problems with. JA: Well, there’s few enough people who even want to get it, but when I see people, most people, in a sense, underestimate how hard it is, and they want to get to it too soon. So I would suggest the main way is getting strong chinning with weight, but you won’t get it that way. But when you’re fairly strong, I made this up but it’s not really a rule, I figured the weight – adding half your bodyweight and chinning that comfortable for, say, three to six reps, but you feel you’re not killing yourself. Then you could start one arm chin training. There’s a lot of different ways to do it. Whatever way works for you. Try different things, and just see what you like best. And then you could try different ways at different times. JA:I would read what people wrote, but the way I do it, not everybody does it this way, but most people who’ve done it twist in and keep your body in. I actually start perpendicular to the bar and twist in, and that’s very important to twist in and a lot of people don’t do that. Jack does assisted one arm chins with a 30 lb dumbbell. With friction in the pulley system, this gives roughly 20 lbs of assistance. You’ll kill your elbows or you just can’t do it. But you can learn balance and it actually makes it easier twisting in for some reason. That coil motion… I think makes it easier. JB:I think so too. How about tension through the body? JA:Use all the tension techniques that are written about on the Dragondoor website. This guy, Pavel, introduced them, and I found them very helpful to me. You see, I had actually done some of them, but I wasn’t conscious of it. So all those tension techniques help you. So learn how to generate tension in your body and that’s the key thing. 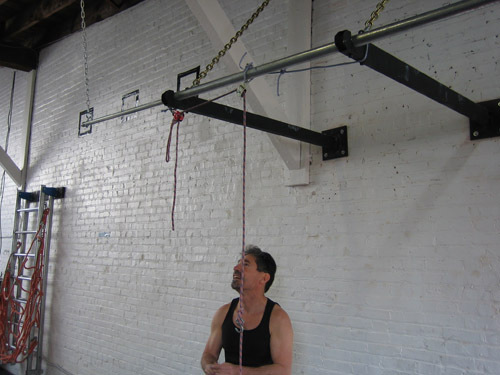 JB:Any advice on the front lever, iron cross, or anything like that? JA:No, the iron cross I did it without training. The front lever is from when I was 15 or 17, that’s when I first got it. In my twenties, I did it in college too, in graduate school, but front levers – adopt a training program and on the internet there’s lots of approaches. I’ve read other peoples, and it wasn’t my approach, but they all have incremental gains. Do something right, and make it a little harder slowly, and this way, have fun, don’t worry how long it will take, and you’ll get it if you stay with it, most likely. Have fun though. Technique is very important, I think for the front levers, one arm chins, chins with weight, yes but less so, but go slow, get good technique, don’t rush to get it done, that leads to injuries, setbacks, and you actually take it slower. JB:I understand. What’s your current training looking like then? Jack's recent training log (click picture for larger view). Numbers represent totals for the week. JA:Well currently, I got injured awhile back, wanting to get the one arm chin back. I do, you can read about it in the guide I put out, I warm up chinning with weight, but my strength is already there with weight. I’m already chinning 120 lbs adding to my bodyweight of 140, so I’m pleased with that, yet I’ve now concentrated more now on the one arm chin. And this thing I do, actually I invented it, if that’s the right word, although it’s probably been invented and I did it too – a type of pulley system, where I’m hanging freely with one arm, but I’m counter-balancing my weight with a pulley system attached to a belt around my waist. And far away from me, using two pulleys, a weight that falls down and picks me up, so it’s anywhere from twenty to forty pounds help now and it makes it easier. Setting up the pulley system. A weight goes on one end, Jack on the other. So you start with a very heavy help, when you can do it without hurting yourself. It’s different muscles than two arm chin. Wait until your technique is good. You’ll know it when it’s good. You’ll feel even and balanced. And do one at a time. Always do righty and lefty evenly in training, I think it’s important to avoid injury and I do alternates, which means one righty, one lefty, back and forth on the same bar. Do one each side to start, focusing on that technique. You need longer bars for this with space on two sides – something hard to find these days. When I was younger, these were the kind of bars they had in YMCA’s. That’s the only gym I went to. Today in the modern gyms, they’re getting rid of their chinning bars entirely, with very narrow, small places, it’s hard to find such bars. I now have one at my house. JB:Also with the training, you’re also doing the alternate comedowns as well? JA:Oh yes, when I was a kid and I didn’t work out in the gym or use weights at all, Jasper told me one day, I was doing in the twenties of chins or something, I don’t remember exactly, I’m doing these muscle-ups, he says “oh, why don’t you practice this exercise”, and he show me this exercise where you pull up with two hands and let yourself down with one – slowly, under control. That’s the goal. Usually, you’re doing in the twenties of chins, and you first try it, it doesn’t happen that way. You start solid and as you lower from the bar, you just lose control and you pull it. It’s best almost to give it up that way, you don’t want to fight it. You’ll have control at the top, with practice you’ll get control a little further down, a little further down, a little further down, you keep doing this until you can control you weight from the top to the bottom to a dead hang. I just did these comedowns. One day Jasper said to me, “why don’t you try a one arm chin?” I thought he was crazy. I’d never tried it before. I tried it righty, and I was killing myself like there was no tomorrow, and he just screamed “Turn In! !”, and I turned in and all of a sudden my chin was above the bar. And then he said, and I was high as a kite, he said “try one lefty.” I ended up doing it lefty too; I didn’t even think about it, and he just said I don’t know how I remember it, “you’re a natural.” Well, I’m a teacher and now forty years later once in a while I see students who do something, I teach math, and I say to myself, “they’re a natural.” It’s not that anybody couldn’t learn it, but with a lot of experience I guess, he had experience, something he saw, that, and I did get good at it. Most people might do it for a few months and give up. It’s now 15… roughly 40 years later … 50 years later and I’m still doing it. So, I’d say he was right! JA:My current goals are actually to do four alternate one arm chins, which I think I’ll get. A front lever I can do now. JB:No problem you got that! You can check that off. JA:I got that, I can check it off. And a bodyweight chin, adding my bodyweight. I did 120 already, I think I could probably do more today, but 140 is not 120! And whether I get to it or not, I don’t know really any of these, but that’s what I’m going to train for. JB:Next one. Reactions at the gym? What are peoples? You talked about this before. JA:Reactions. Well, if I stay at the same gym, they know me to a certain point. The reactions stop, but I’ll tell a story. My wife’s really not that interested in my exercising so for my 55th birthday, I asked for my birthday present that she would come to the gym with me and watch my workout. Which she did. So she came there with her sour face, she hates sweat and this macho maleness is not her thing. So, while at the gym, a muscular looking black guy comes in who I had never seen before. And I think he just saw me do, probably one arm chinning. I noticed and my wife didn’t really… she was half reading a book and half watching me, he walks over to her and says, “See what this guy here just did!!! No one here could do that!!! This guy is amazing, he’s the strongest guy in the gym!! !”, my wife gave him sort of a dirty look and he walked on. JA:Thousands of hours of training is the way you do it! It doesn’t happen otherwise. So I get this reaction a lot in gyms. Usually by the people who have heard about one arm chins, other people think it’s fun, but they have no idea really what it really means. The difficulty. "Oh that’s good, how do you do that?" It takes awhile. Even if you’re strong, it takes awhile to get it down. JB:Yeah, definitely. How do you stay motivated so long? I mean, you’ve been doing this for decades. What do you feel is the best way? JA:I love to feel my body. I just love doing it. Now, I am a show-off I learned. I wasn’t always a show-off when I was younger, I was very shy actually, which is the opposite of the way I am now. And I learned I liked the attention I get from this. I’m motivated by, now it might be … I thought about this a lot … I was shy and sickly a lot as a kid, I wasn’t popular with women, or even felt very uncomfortable with them. And I think somehow, because it coincided with me getting strong and getting respect from the men, it became very much a part of my self-image. I could do this. So it’s so deep, that I just do it because it’s part of my self-image. Now, of course my best friends have told me, “You don’t need this! What are you proving?”, but it’s deep, I understand I don’t need to prove it, but I really love the feeling in my body when I do it and addition to everything else. But it’s all tied as one package. And so now I workout mainly at home, I don’t show off at the gym very much anymore, today was an exception, but I love doing it every morning in the morning at 5:30 or 6:00 for an hour to an hour and half before work. I just love, I’m high from it. I just loving doing it, and I think that’s the best motivation. And the people I know who’ve done this who are my age, they do it not to lose weight, they just do it because they love it. Jasper is a very happy man, he can’t do the previous levels, he still does the levels that are amazing for people, one arm chins, front levers, but he just loves it. And I guess, I can say the same thing. My motivation is, I’ve never had a bad day at the gym. I love it. JB:What do you think of the current interest and the whole community of bodyweight exercising, with things like Dragondoor and different sites like that? What do you think of the current scene? Do you think it’s good? Bad? JA:I don’t follow the scene that much. I did for awhile. But on Dragondoor they have some great people who know great ideas in training. I met some great people there. Brad Johnson and others. Through Dragondoor, people have met me. But this idea of bodyweight training, I can’t say especially that – you just weight train, so what? Bottom line is make yourself happy. I have a good friend, he does great bicycle riding, he did strength in his life, earlier life, and he’s now a trainer at 64 in gyms, what does he say to people? “What’s the best workout? The one that you do.” So I’ll change it – “what’s the best workout? The one that you like.” You could change it, you could do what you want, I’m not going to say one arm chins should be your goal. I happen to like these things. But I always find friends at the gym – the squat master, or the guy that curls, or the people though that I guess are like me. I do see one similarity, to succeed often, it’s often an obsessive personality. Some reason it’s important to that person. Most people don’t stick with it, to get to a high level and anything you do that’s worthwhile, that’s hard, it took work, but that’s what makes it more satisfying. I was the wimp, so I really feel good in my accomplishments. That’s what I rate… if I get this one arm chin back right now, which I think I will because I’m very close, that’s my best accomplishment. It’s hardest now than it ever was before. So have fun with it though. And if I don’t get it, I can really live with that now too. It’s like, I’m enjoying the training. Although it was hard for me today to prevent myself from the first thing, to just warm up and try a one arm chin. Because I know I was pumped. I know I might have done it, so to me I felt “gee, you’re finally growing up.” You actually didn’t do that. So anyway, I just love doing it. And if you get injured, you can not. I would think, pick the long view. This is part of your life if you like something. What’s the rush? Do what you enjoy doing as long as you can. So the bodyweight is not special to me really, it’s just my thing in particular. I met a man once who threw boxes. A truck pulled up this is maybe a while ago, you don’t see these trucks anymore, in front of a store that sold fruits, and an old man in his seventies got out, with a fat belly, and this 22 year old guy was his helper. The old guy goes to the corner, there’s all these empty crates of vegetables, I guess they recycle them then, and he would throw them up to this flatbed truck with wooding siding. He throws them up, the other guy catches them and stacks them in the truck, maybe 70-80 boxes he threw up. And I’m waiting for my wife at the train station where this was, in front of the vegetable store. The guy bends over with his back, and throws up the boxes, perfect straight up, it reaches the height of the truck, it tilts by itself, the energy runs out, it tilts sideways and it lands in the other guy’s hands. The helper there was glistening muscular. It’s clear that the helper could’ve done that too, but I watched this for maybe ten minutes until all the boxes were done. I get out of my car, I went over to the guy throwing the boxes and I recognized the knack for the one arm chin, that was his “one arm chin”. I could just see it, the way he did it. I said, “You’ve done this for years.” He just looked at me, I said, “it’s fantastic, the beauty in watching you.” And it was perfect. He knew how to throw boxes, he didn’t give it up, he took pride in this. It was done with perfect technique, and I tend to admire people who, they love what they’re doing, and I didn’t care it wasn’t what I did. And, uh, I don’t know why I started talking about this, but … and I know Brad Johnson who does his own thing, he also has the same thing, we both love to see other people enjoy doing their thing. Here was this guy beeming that someone mentioned it, but he was me. He was doing his thing. And I like the incongruity, you think the young guy is doing the hard work, but he loved doing this. JB:How do you feel about John Gill ranking you in the top 10 for chin-ups? He’s got several different methods for ranking. You’re top 10 in both of them. JA:I was flattered. I’m not sure it’s accurate, there’s probably many, many people above me, even at my best. relearn his one arm chin from a free hang. But I don’t judge people, one thing Jasper said which I now tell people that are younger, “a one arm chin is an achievement, if you do it once in your life, you’re in the one arm chin club. If you do ten or one, you should be very proud of it. And you should… you’re in the club. You can’t get out of the club once you’ve done it! And so I always tell people that because it often happens you do get injured or life takes its turn, you should feel proud of it, and that’s it. Enjoy it the fact that you did it. It’s best to enjoy what you did, and not compare yourself to others. The best is only the best for four seconds anyway…or that moment. So enjoy what you do is basically what I’m saying about that. JB:We touched upon this as well, any common mistakes you see around the gym when people are training? Not necessarily the one arm chin, but just in general? JA:Yeah, yeah… well, I would make your goal to have fun at the gym. So that people who go to the gym to lose weight, to get stronger, to look good for the summer, for any other reason, and they’re all good reasons! So you do that fine. But, have fun, make it fun for you and figure out what that is, otherwise you stop doing it and don’t achieve your other goal. A main mistake is some people don’t have fun, but even some people are very serious and having fun, they’re driven. And I know this by living it. This is not from reading books, I was like that. You make mistakes, and you go too hard. Take the long view, don’t get injured, say to yourself “if I like this, let me do it my whole life." Adjust when you can’t do it as hard. Be alert to your body. There’s too many people who do it by the numbers, or wrote, and push themselves, and over and over again I’ve seen over my time, I don’t count them, but dozens and dozens if not more, hundreds of people, they’re there, they’re gone, they’re there, they’re gone. Either cause it wasn’t fun, or they got injured. Today I was very proud of myself, not showing off fully, that I didn’t get injured. I didn’t show off fully. So the biggest mistake is being desperate or pushing it. I’m learning this from yoga too, be happy what you’re doing now, and what Jasper always said, if you asked him, “how long will this take?”, he would just dismiss that, “who knows how… just practice now!” You really don’t know what the future holds. Maybe you’ll never get it! Enjoy it now. JB:That’s fantastic advice. You were also talking about people being unfocused? JA:Oh yeah, that’s right. If you want to gain from your workout, you shouldn’t be reading a book, or distracting yourself even with music. If you concentrate on what you’re doing, it will benefit you greatly. The only reason I could do one arm chins or achieve anything, and I was a weak kid and maybe as an old man I’m weak, but I can do these things because I focus. And that’s a skill I’ve learned. It’s not just a skill I use exercising, in everything I do. But if you concentrate on what you do, while you’re doing it the world goes away. And after you do it, you analyze it. What went right, what went wrong. If it never goes perfectly right, don’t say “oh, I didn’t do that.” Say “why?” And apply it again, and each time you do it, analyze it and do it, like in a scientific approach. This approach in my experience in life, in all the things I’ve gotten good at, it works no matter what you do. There’s no formulas, don’t believe anybody else. Don’t listen to me, don’t listen to anybody, read what they say, listen to them, and then test it, and if it seems to work, do it. If it doesn’t, change it. If that doesn’t, change it. You change daily, your body changes daily, so what works today needs to be changed tomorrow. The key thing is flexibility and constant awareness and analyzing, and if you do that, you’ll achieve your goals – maybe, maybe not, but if you go with happiness, you’ll have gotten as far as you can go. And you should be happy with that. JB:Any thoughts on the new types of gyms? I call them “non-traditional” gyms like Primal Fitness where we were today, or Balance Gym that you also saw? JA:Well I saw two gyms today which are different than the gyms I was more familiar with. By the time I started going to gyms they were like what I now call “old school”. In some basement, they had some weights, they had a great chinning bar, it was just very basic, and I like that. And the gyms I saw today, Primal Fitness and Balance Gym, didn’t have as many machines as all these newer gyms which I’m more use to now. For those places, I just come in and ask for the chinning bars. The people at the gyms I saw today were very friendly, very nice, and I like that ambience better. But once again, I have to say, do what works for you. If you like the machines, I’m not telling you “don’t do the machines.” You do what you like, and have fun with it. I like myself, the chinning bar basically some weights, some sports too, basketball sports. I guess you could say, I love to feel my body in motion. And then you could say, I also love seeing other people’s body in motion! So a gym is something that I just love being there. So I do like those gyms today, they were very nice. You don’t need all the fancy equipment. Sometimes I feel it’s gimmicks. It’s “what’s the thing of the month”. So it’s spinning this month, next month it’s pilates, next month it’s yoga, next month it’s something else, now all these things are good! They’re not bad, but you don’t need a gimmick. Workout what you like, stick with it, have fun. JB:I think we covered a lot of things. Thank you so much Jack. JB:… I don’t know if that’s true! JA:They say “I don’t know if that’s true!”, but I tell you what I mean by that. I’ve actually learned to listen to their modern science, their modern bodybuilding, their modern strength training and I incorporate that. Now what I tell them, although I do tell them a few techniques or show them something, it’s very hard, in my opinion, based on most of what I’ve dealt with, to understand when I say to them, even though I say it “take the long view, go slow, have fun.” It took me, to fully internalize this, in my 60’s say, and so when I tell them that I’m not sure they really hear it. They do hear the words, but it’s one thing hearing the words, and following it. JB:Well, we’re invincible at this age, you know that. JA:**chuckles** yeah, that’s the thing. They tend to push it too much in my experience, and what can I say? That’s what I did most of my life. It took me a lifetime to learn this, so someone who’s younger, and Jim may be one of those people. I’m amazed at his wisdom, but it’s fantastic. JB:Well thank you so much for this, again it’s absolutely fantastic. Thanks again, I think we had a lot of fun.